This report covers primarily magnesium oxide (also known as magnesia), with additional data on magnesium hydroxide, magnesium chloride, magnesium sulfate, and precipitated magnesium carbonate as available. Magnesium chemicals are used in many different applications, including refractories, agriculture (both as fertilizer and in feed), magnesium metal production, water treatment, deicing, pigments, and paints. Magnesium oxide is the most commercially important of the magnesium chemicals. China continues to dominate the market as the largest producer and consumer of magnesium oxide, as well as the largest global exporter. In 2016, 83% of Chinese magnesium oxide exports were refractory magnesia for use in steel manufacture and cement production. The other 17% are caustic calcined magnesia, destined for environmental, construction, and agricultural markets. Global consumption for magnesium oxide is set to increase by an average of 1.5% per year over the forecast period of 2016–21. Large mineral deposits of magnesite are located in China, North Korea, and Russia. 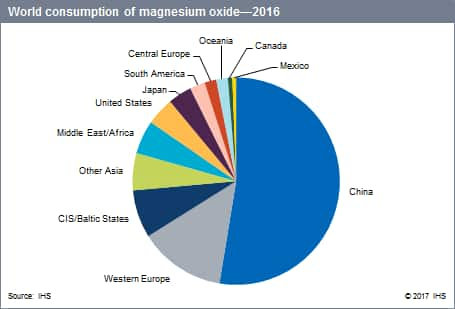 China is the largest producer of magnesium oxide from natural magnesite, accounting for about 64% of the magnesium oxide produced in 2016. China’s abundant magnesite deposits result in most of its domestic producers manufacturing magnesium chemicals from this natural ore.
Refractory magnesia consumption has declined since 2013. World steel production declined from 2013 to 2016, and there has been a corresponding slackening in demand for magnesia refractory products. The forecast for global steel production growth is 1.3% for 2017 and 0.9% for 2018. Cement production, another major use for refractory magnesia, has stagnated in many regions over the last three years, which, with a slowdown in construction projects, has also contributed to the lack of growth in global refractory magnesia consumption. Over the last few years, China has been exporting increasing amounts of cheaper fused magnesia and deadburned magnesia for refractory products, and producers in Europe, the United States, Russia, and other regions have been struggling to compete. An overall growth rate of 1.5% per year is forecast for refractory magnesia during 2016–21.